Minimalist Superhero Vintage Retro Movie Posters | Nerd Much? Minimalism is always a great look to strive for, but you know what makes it even more appealing? Superheroes. CultClassix is a shop on Etsy that is known for its minimalist posters, ranging from posters of David Bowie to Disney Princesses, and everything in between. 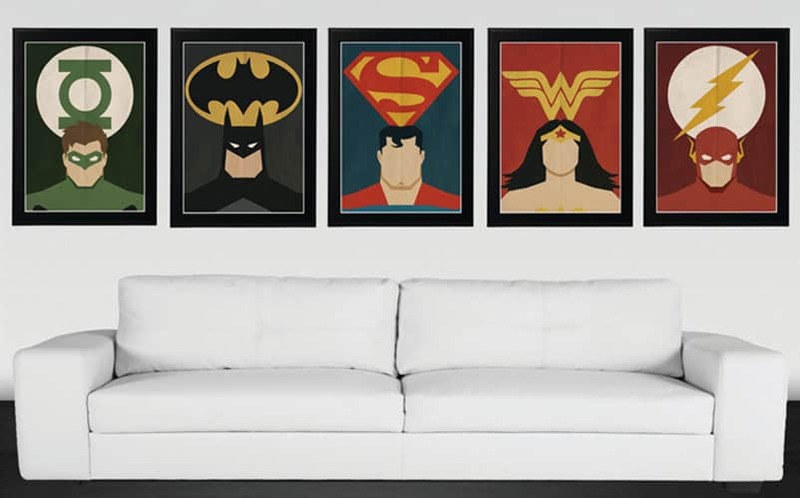 That’s great and all, but the gem of their offerings is the set of five Justice League minimalist vintage, retro movie posters that include Green Lantern, Batman, Superman, Wonder Woman and the Flash. Each poster is printed on high quality 220gm textured paper using professional quality inks and printer (these aren’t printed on whatever HP printer you have in your house right now). Each print has a 5mm white border for framing purposes. CultClassix also has them available individually, and also has a collection of Marvel minimalist posters of the same nature. Regardless of which set you choose, these superheroes will surely protect your living room from evildoers. Buy the Justice League Minimalist Poster Set here. Stay tuned to Nerd Much for more cool stuff you can waste your money on.